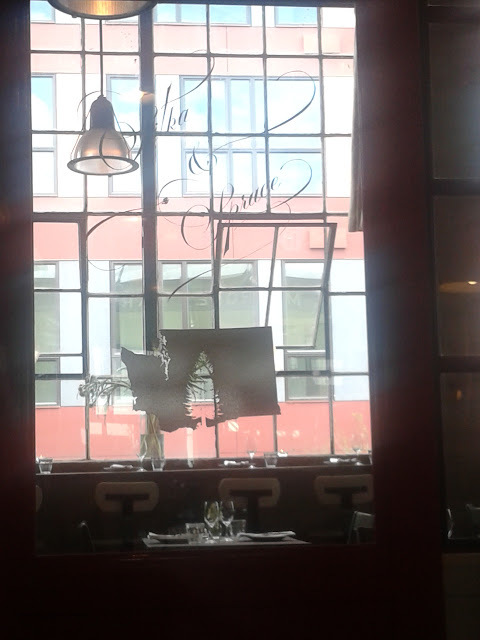 The little restaurant is located inside Melrose Market , which also has a bunch of other little shops inside as well. It is a farily open space with windows all around letting the light in offering green house feel to the atmosphere which I found really comforting. They're menu, I believe, changes every day so click HERE to see updated menus for Sitka & Spruce. 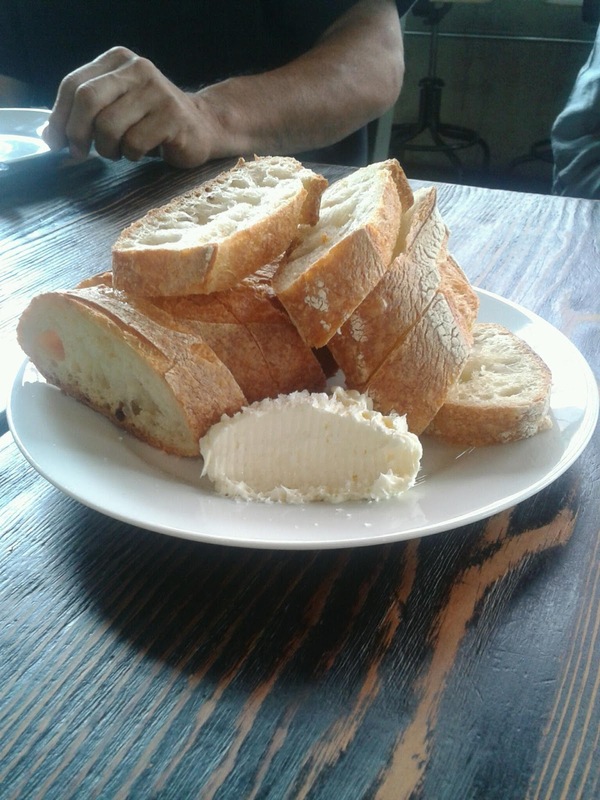 We started off with their bread of the day which came from the Columbia City bakery (located in south/central Seattle). The baguette was nice and crusty on the outside and soft on the inside. The whipped butter with the sea salt flakes paired nicely with it as well. 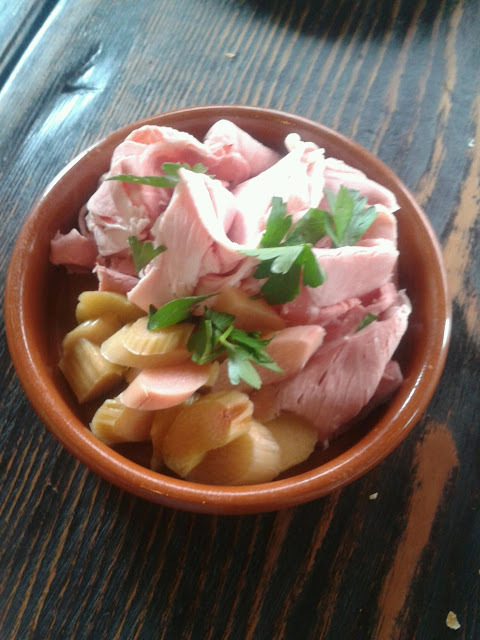 The brined & baked ham with fermented rhubarb was also a nice pairing to the bread. I've never had rhubarb in a fermented/pickled form and found it quite nice. 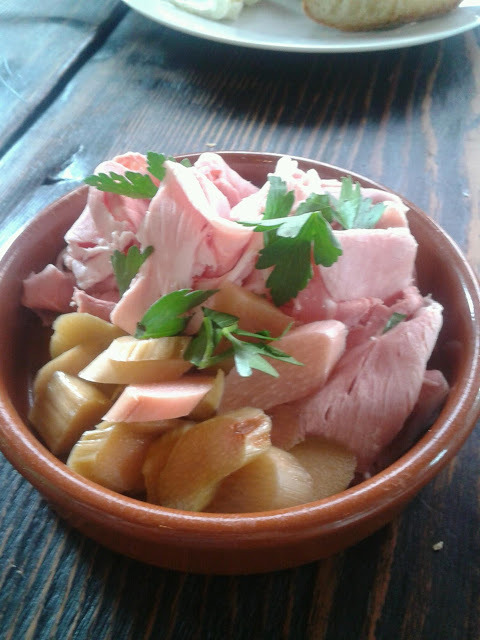 It had the sour/tartness of a pickled radish and went well with the mild flavor of he ham. The fresh Italian flat leaf parsley also added an earthy element to the dish and when eaten together, it offered a nice, clean, fresh taste. 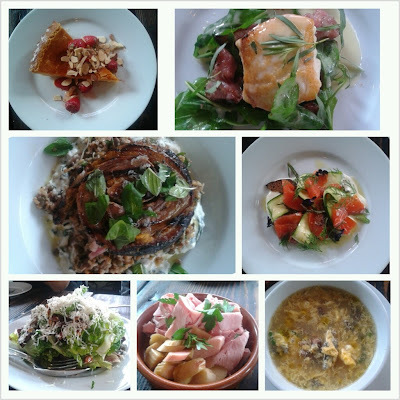 The tartness of the rhubarb really enhanced my appetite. 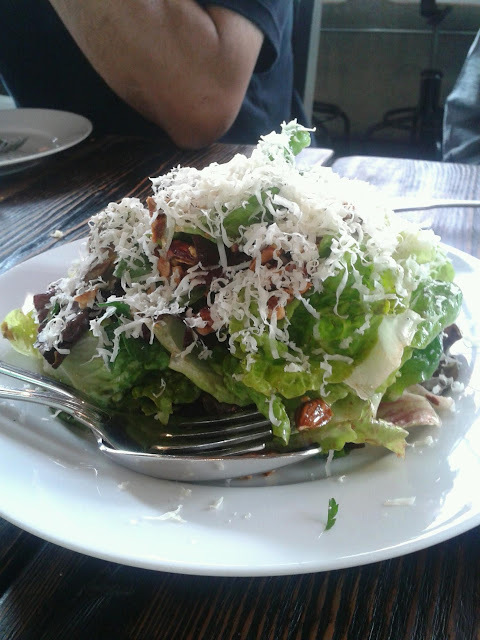 Then came our salad which consisted of young lettuce (romaine I believe) hazelnuts and a cow tomme cheese. 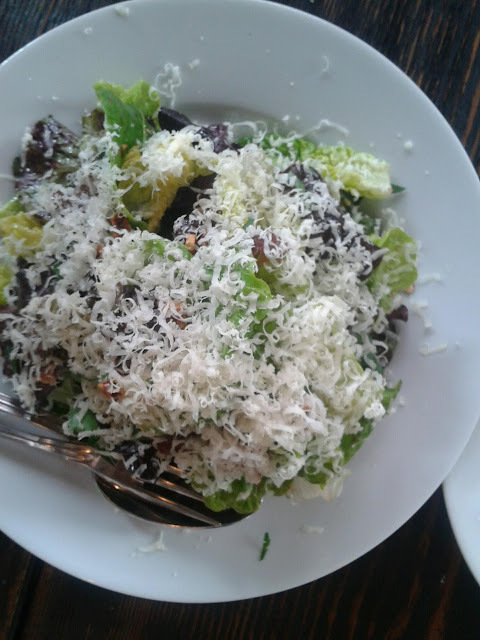 Nothing much to say about this salad besides the fact that it was indeed fresh and the vinagrette enhanced the sweetness of the young lettuce. The cheese added a nice salty touch and the nuts added a crunch of texture. 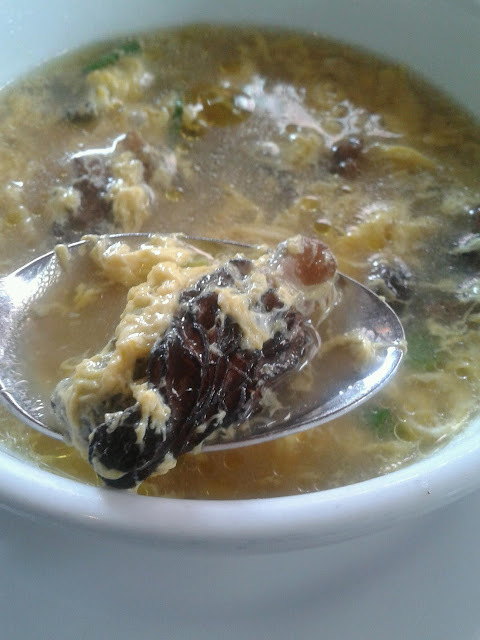 Then we had the black morel (mushroom), garlic spear, and egg soup. 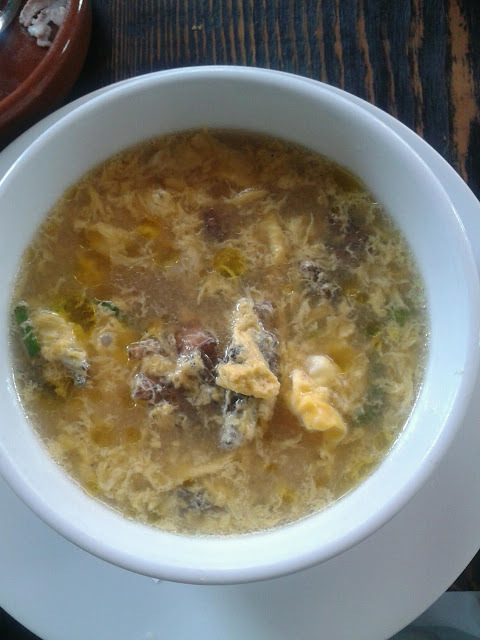 At first glance, it looked like a typical Chinese egg drop soup, but that is where the similiarities end. the flavor of the broth was more robust than your typical egg flower soup but I can see inspiration taken from the Chinese soup. The morels were excellent and provided a meat like texture to the soup. It was quite unexpected but welcomed. It brough a sense of heartiness to the soup. The chopped up garlic spears/scapes also added a nice mild onion-y flavor and texture to the soup. Then the beaten egg that was added to the soup created a fullness to the soup as a whole. Overall, this was a really excellent soup. 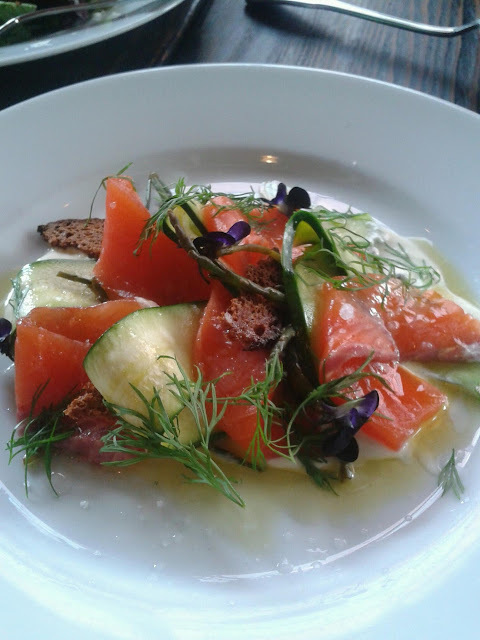 I really wanted to try the raw salmon, but was a little put off by this dish since it had zucchini in it. I'm not a huge fan of zucchini but found that it worked really well in this dish. 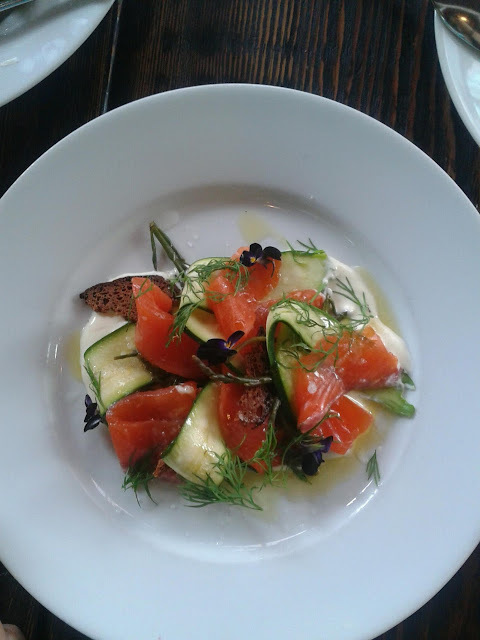 The soft texture of the zucchini paired nicely to the raw salmon (which by the way was not fishy at all and you could taste the pure flavor of the salmon.) Along with the crunchiness of the rye bread, the texturse flowed nicely. I found the dill to be a little too overpowering in flavor, but the sea bean added the right amount of tart and salty flavor to the overall mild flavoring dish. 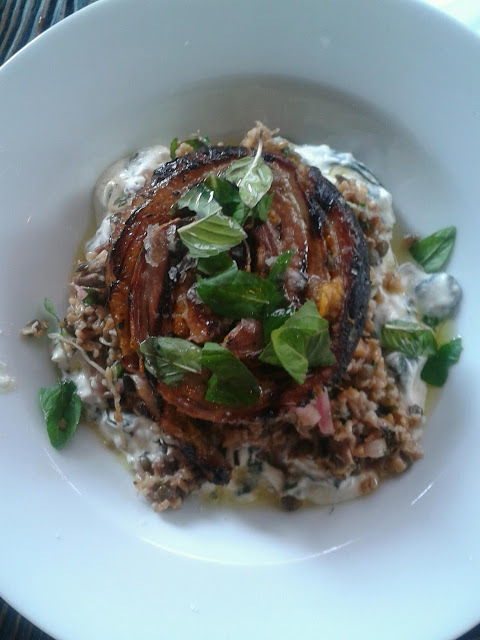 Then came the lamb belly and lentil dish. This dish is the perfect way to consume lentils, in my opinion. The lamb was nice and soft and flavorful without being gamey, like most lamb dishes are usualyl known for. I was nice and moist, most likely from the fat, and paired nicely with the lentil and emmer and borani (a Persian appetizer with yogurt). 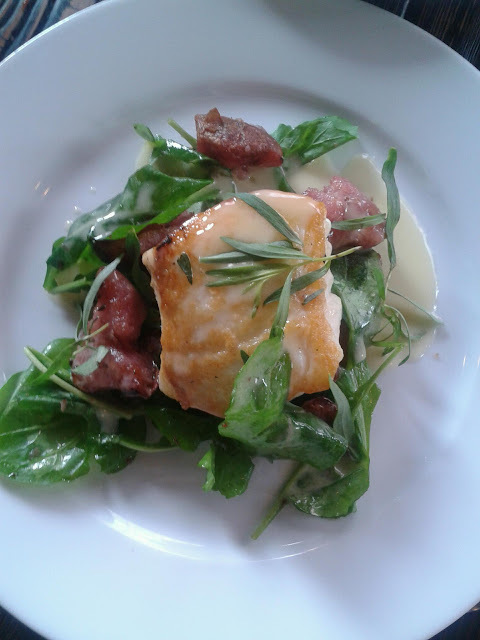 Then came the halibut dish which though it was good, didn't impress me as much. The piece of fish was a lot smaller than I thought it would be. The flavor and method of cooking the fish also wasn't too impressive. It was packed with a butter flavor, but I will say it was cooked well and wasn't too fishy in smell. I did enjoy the terragon leaves however as it added an unexpected twist. The potatoes were also good and gave a new appearance to how to present potatoes since it looked like meat. Overall, this dish was okay and something I could pass up. 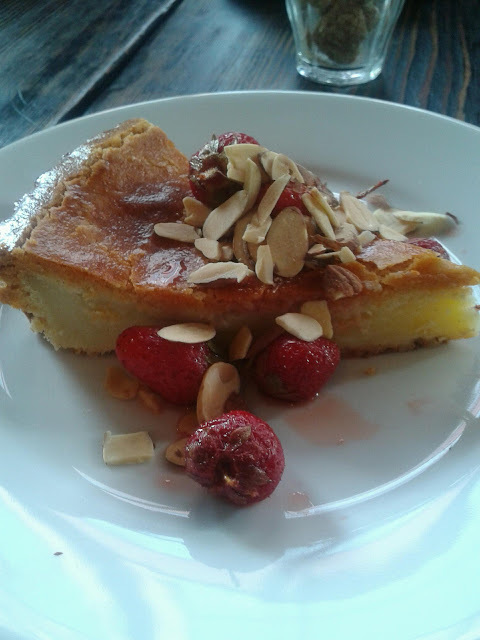 Lastly, we tried the gateau basque which I would say is like almost a soft thick custard type of pie. It was not to sweet and it was creamy on the inside with a nice flakey crust. The strawberries paired nicely with the this tarte like dessert as it was sweeted and seemd to have had the strawberry flavor enhanced. It went really well with the coffee we had as well. 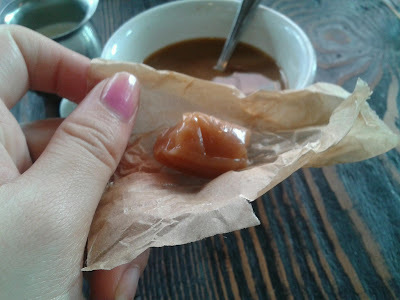 As we got our check for the evening, they came with the caramels (which I also believe they hand made). 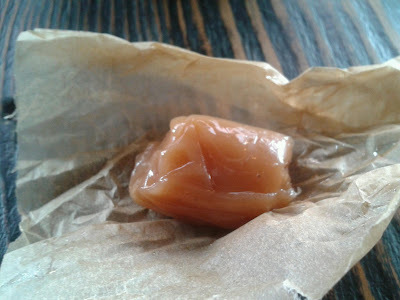 They were nice and soft, but seemed a little greasy since the butter that was used to make the caramel perhaps was too much? It oversaturated the paper wrappers they were held in. 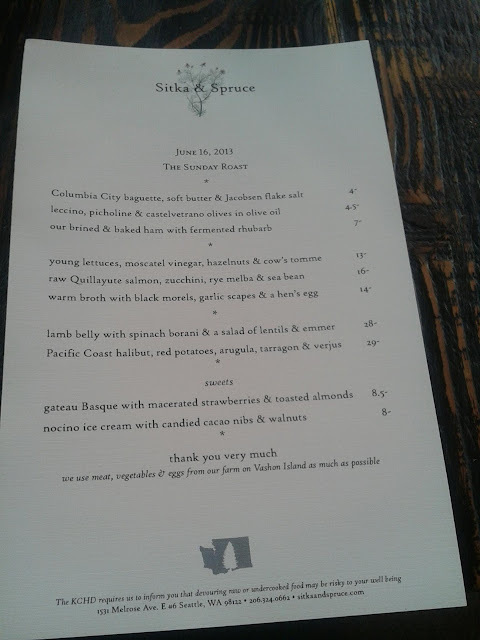 Overall, I would like to try this place again, maybe for their brunch or lunch even! I like the idea and concept behind using fresh ingredients on the daily and providing a new menu almost every day to keep things unexpected. It is a little pricey, but you are paying for the services (which by the way is excellent) as well as the quality of the food.